After a mix of rest, relaxation, and fun in the snow in Neukirchen, Austria, we returned to Freising refreshed. We would stay here now until early April. 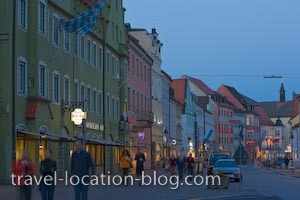 Shops along the main street - Untere Hauptstrasse during dusk in the City of Freising, Bavaria, Germany, Europe.